Welcome to the KGB website. 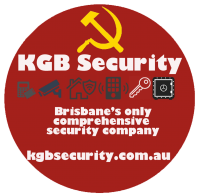 Here at KGB we are proud to be family run security company. We are fully Australian owned and based in Rocklea, Queensland. We are passionate about providing the best security solutions, regardless of the building; commercial or residential. We are a team of hand picked locksmiths, motivated and driven individuals who are making sure Logan City is secure. From locks to safes and CCTV, KGB are your one stop security shop. Your home or business needs to be secure not only against today’s security threats but also any future issues that may arise. Here at KGB we are passionate about professional, reliable and efficient solutions to all of your security needs. To installation of the latest in alarm system detection to installing an access control security card swipe system, KGB do it all. We deliver and install all security systems Logan City wide and beyond. We have a huge number of long term clients who are delighted with the 24/7 service. Call KGB today for all of your security needs. Established in 1987 by Geoff, Brock and Kel Phillips KGB has gone from strength to strength and we have over 25 years of trading under our belts. We began trading from Greenbank, moving to Acacia Ridge in 1988 and then went to Boundary Td, Coopers Plains. We have now settled at 742 Beaudesert Rd in Rocklea in 2005 and have no plans to move anytime soon! We began our life originally only focussing on physical security and locksmith solutions but have expanded vastly from these original roles, now encompassing safes, vaults CCTV and electrical security solutions. We were proud to be made one of Brisbane’s only two Chubb Safes Premium Dealerships. We were excited to move into access control technology in 2007, creating KGB Security Electronics, appointing John Lent as the head of this new division. Reigning from the sunny beaches of California, John has provided cutting edge access control solutions to our security company and with over 30 years of experience you can be sure he knows his business! Recently we have been working on a stand-alone wireless access control system. This will allow a solution to any large remote site in South East Queensland. We make sure that the attitude is dedicated, driven and focused on client satisfaction. We have an incredible team and this shows in our results! We also make it a priority to give back to the locksmith community, not only giving TAFE training to people at Eagle Farm campus but we are heavily involved with the national locksmith guild of Australia. Kel Phillips was the National President for the Locksmiths Guild of Australia. We are also members of the Master Locksmith Association of Australia and have close business ties with many security companies through Queensland and Australia. For any questions or queries about any part of security we are your guys! Give us a call on 1300 542 732.